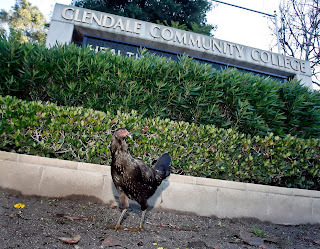 La Cañada Flintridge Real Estate Blog: Why Did the Chicken Cross the Road? Apparently, just for some attention. A black hen has found a home behind the electronic billboard at Glendale Community College for almost 2 months now. The chicken has caused quite a scene on the corner of Mountain and Verdugo Road by almost causing a number of traffic accidents. Animal control officers have made several attempts to capture the chicken but have been unsuccessful. They would like to relocate the chicken to prevent traffic accidents and/or being hit by a car. Yesterday as I drove by to see if this chicken really did exist I saw some small children with a net trying to capture the chicken.